Obverse: Diademed bust right, holding sceptre over left shoulder. Reverse: Cross with pellets at each end, CA in lower angles, within a beaded border. Text around VARIMV[NDVS MO]NE. History: After the Romans withdrew from Britain in the early fifth century, no coins were struck in Britain for nearly 200 years. 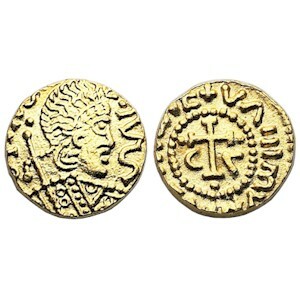 Native Anglo-Saxon gold thrymsas were minted from around the 630’s, initially in the style of their continental prototypes or obsolete Roman coinage and later being made in pure Anglo-Saxon style.